The UK is one of the world’s top-ranked markets for internet penetration: Over 80% of the population will go online regularly in 2017. Mobile phones will be a key driver of usage, with nearly four out of every five internet users going online via the device. The number of internet users will increase only slightly in 2017, rising 2.1% to total 54.4 million. eMarketer has raised the overall number of users, based partly on recent data showing higher-than-expected usage among young children. There will be 42.7 million UK smartphone users this year. While growth will slow through 2021, over two-thirds of the population will use smartphones by 2019. Remaining increases will be driven primarily by children 11 and younger and 55- to 64-year-olds, who will see double-digit growth in 2017 and 2018. As overall internet and mobile usage grow, so will social network usage—up 3.4% to 36.6 million users in 2017. The biggest growth will come from users ages 65 and older, rising 17.9%. By 2021, this oldest age group will account for one in 10 social network users. 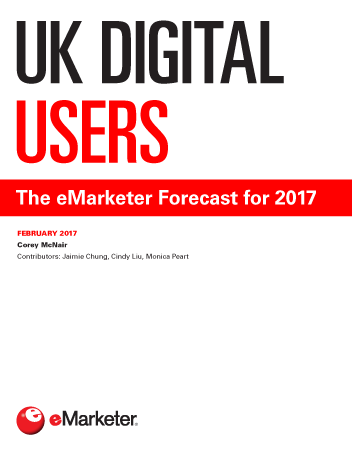 For the first time, the forecast includes estimates for Instagram and Snapchat users in the UK. Each platform will have higher penetration than Twitter—among both internet and social network users—for the entire forecast. "More than 80% of the population will go online regularly in 2017. Nearly two-thirds will watch digital video and use smartphones, and over half will use tablets, access social networks and listen to digital audio."